What exactly is wrong with us British folk? A recent survey of 1400 brits by the property website HouseBuyFast showed that given the opportunity up to 70% of people would move to far flung locations with the US, Australia and Spain topping the list. To be fair the other 30% said they would rather stay put, but this begs the questions, what is the appeal of these far away lands and why would people want to up sticks and travel half way across the world? I think I might have the answer and its a quintessentially British one – the weather! Our lives revolve around it. We spend the winter dreaming of warmer climates, fantasising that one day we’ll pack up our worldly belongings and move to somewhere sunny. Then we spend the summer moaning about heat waves, inclement rain. And when the weather at home is at its best, what do we do? We jump on overpriced flights to European beach resorts with names we can’t pronounce and spend 2 weeks cooking ourselves and getting fat on the all-inclusive breakfast buffet! OK I’m generalising but you get the point I’m sure. What occurs to me is that the problem with the UK is not the weather but people’s mindset around the weather. Lets face it, its one of the few things we can’t do anything about. But in reality the best things about living or holidays in the UK you can do with or without the weather. 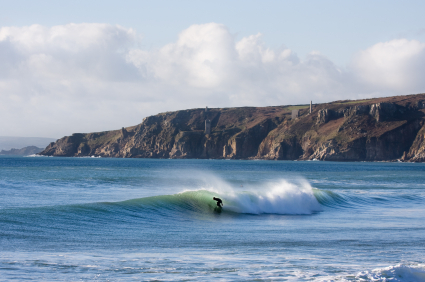 Our best surf spots are actually rubbish when the weathers fine! So stop dreaming about getting away and actually get away. This winter put on your woolliest jumper and best rain mac and get out there and enjoy the best of the British winter! Ever-spiralling foreign travel costs and a faltering UK economy have done their bit to popularise the ‘staycation’, which not only gives the average holidaymaker more pennies to play with but also benefits the environment as we collectively reduce our carbon footprints by holidaying in the UK. Unlike the Americans, the British are not always so keen to create unashamedly patriotic films that inspire pride in the viewers. However, there are a few gems that have been made over the years, all of which will leave you feeling proud to be British, and here are 10 of the best.